A bike trainer, also known as turbo trainer or bike stand trainer, is a practical way for training both skills and muscles at home. It is a stand that people use on their bike, as trainers are adaptable to many options. It works by attaching it to the rear wheel of the bike, while it still allows the cyclist to use their bike as they always do. The bike trainer offers adjustable resistance to mimic the outdoor experience and allowing the rider to pick the intensity they need while benefiting from the training and exercise options they want. Aimed at both professionals and amateurs, this article means to educate on which are the options for you to get the trainer you need. It covers the three main kinds of bicycle stands: Fluid, Magnetic and Direct Drive. Every type will be explained extensively, with focus on the cycle training each of these allows. We will mention a few different kinds of options for training, such as smart trainers, rollers and even ways to improve the indoor workout as mats or power meters for example. Searching for the perfect indoor bike training option can be an exhausting job since there are a huge amount of options you can choose to improve your at-home workout. Through comprehensive bike trainer reviews, we will help you pick the one that suits you best. Our picks for the best trainers for the money. Who uses trainers and why? 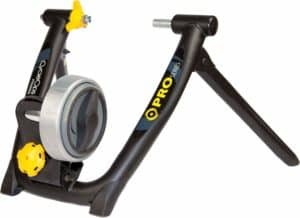 Bicycle trainers are used by athletes and bike enthusiasts alike, as they allow the cyclist to train properly in the comfort of their home, or at the gym. It is quite different from the regular stationary bike and what it has got to offer, both can be used for exercise, but trainers provide a more intense workout on skills and muscle training. The trainer type of technology is a lifesaver for athletes and bike enthusiasts who want to mimic the outside experience. Bike trainers are called so because they are meant to help you exercise your motor skills such as agility and balance, your mental skills such as focus and strength and effectively exercise your muscles. All of this, of course, while improving other aspects of your health, but those are not the primary focus of these objects. They are meant to help you achieve your very best at biking while being practical too. Shall you still be wondering what benefits a trainer will bring to you, here are some of the reasons cyclists and amateurs use them to train against other kinds of bicycle training. While we could compare them to the traditional stationary bikes, which allow you to work on your cardio and lose some weight, there must be a plus for being able to use your bike, either you are a professional or you elected biking as your favorite exercising method. It allows you to adapt it to your body and goals best, with a lot more detail than its gym counterpart. Many athletes are going for trainers these days, as these help you enhancing your biking skills rather than just your health. Riding your bike in place makes you focus on the task, rather than the dangers you would face outside. You may concentrate on your pedal strokes, pain and breathing rhythm with no distractions while improving your mental strength. Fitness is also enhanced by not having to deal with the issues you would have outside, so you can monitor your cycling sessions as you would like, for instance, taking intervals or not, since you do not have to oblige to road signs. Also, you may cycle all year-round, with no snow, rain or strong winds to make your training session harder. You control your training fully when it comes to these trainers. You can work on your cardio, on your skills, your body mass, your muscle building and on your overall fitness. The past and the future of bicycle trainers do show the passing of time, as these have been evolving with the technology advancement. The grandfather of the modern-day bike stands is the roller. This archaic, yet still used, is an indoor cycle method that may not offer resistance, but it does teach and improves your balance even though it is trickier to use. In other words, this kind of bike trainers is not for everyone. You can buy a resistance adapter for your roller, but in the end, it is what it is, an old-fashioned option. The most prominent feature of the roller is that it is quiet, but so are most of today’s choice options. We have written a guide to help you understand better the differences between bike rollers and bike trainers, click here to see the guide. The most current, yet futuristic – which appeals to tech-enthusiasts – option for indoor at-home trainers is the Smart one. As the name suggests, it may come with many features that go further than any other trainer. These can give you the real feel of biking while you are training at home, you can connect it to your TV, it can show you your progress, but let us explain you these down below on its technical description. We wonder what will come next, after this trainer allowing so much. It is a peek into the future. If you’re ready to warm up like a pro cyclist before the big event or to cool down afterward, therefore tackling the challenge of achieving the toned muscles and body mass you need from your training, trainers are the way to go. Taking into account these goals, along with all the other benefits, will profit you by knowing which kind of bike trainer would suit your needs best. We gathered the specifications of each of the main three types of bicycle trainers for you to analyze and figure out the one indicated for the use you want to take from it. There are a few important features we would like you to take a look at, such as noise level, resistance level, weight and volume of the product and how manageable it is regarding storage. We covered these and more so know exactly what kind of turbo trainer you need and buy it with full knowledge. For instance, it is important to pay attention to noise if you want to watch TV while working out and training your skills or if you live in an apartment and don’t want to bother the neighbors shall you train during the nighttime. Resistance may be important for some, but irrelevant to others. Fortunately, there are options available to nearly any trainer and training goals. Another relevant aspect is the in-home storage of the machine. If you are a professional cyclist you may need your trainer out, mounted and set up ready for your everyday training. If you are an enthusiast who needs their setup now and then, you might want to look at a piece of easier dismounting and storage so that you can use up space for other means and still mount and train whenever you want. Either way, durability, and intensity are vital factors that you should have in mind when looking into buying a turbo trainer. With no further ado, let’s aim at how to turn your bike into a static bike and take a look at these bike training kinds and their specifics. Let’s focus on fully magnetic indoor cycling devices first, and on particularities such as the kind of resistance, they may feature. 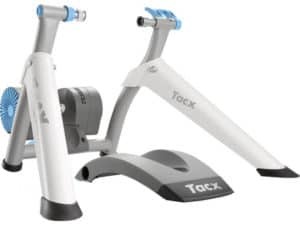 We must start by stating this kind of turbo trainer is an entry level equipment and it implies that there is a magnetic flywheel which creates resistance on the back wheel. 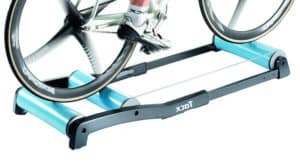 There is a downside though: the amount of resistance you use has a limit, and it is fixed, which means that pedaling does not get harder by your speed, and these type of bike stands get easier to break as you pull harder. 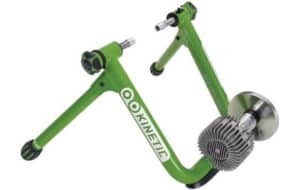 Also, we must mention that this kind of bike trainer isn’t the quietest, especially if you want to watch TV or otherwise multitask with little to no inconvenience. On the upside, it’s low on friction, the resistance provided is boosted for better intensity by a more prominent pedal stroke and better connection to the gear you choose. You can simulate some of the different exercises, and difficulty levels you would typically only face on the road, such as easy roads, intervals or hills and some may have the useful feature of using a control to change capabilities on-the-fly. Some models may require you to get off the bike to adjust its settings. The magnetic kind of turbo indoor cycling device is an excellent match to lower-geared bicycles or the more professional ones. You can find it easily foldable, some of them can turn flat and lightweight for more efficient storage and may be sold already assembled. Fluid trainers are called so since they have the same flywheel, but instead of a magnet, they have an impeller moving through a fluid. It is also important to mention that these work with progressive resistance, it increases as wheel speed increases with its power. Its hydraulics rises resistance, and this means that it mimics an outdoor experience and you may use your gears to adapt the resistance to your needs. For a warm-up, spin it using a lower gear, and for harder work, you may pedal harder, and resistance will improve. Once you reach 18 to 20 mph, speed is harder to keep, and this means no moving parts are dealing with the fluid compartment. When it comes to noise, it is quiet, especially when combined with the in-ride matt or a carpeted floor. There are some problems considering these trainers, though. For instance, fluid trainers are prone to overheat over time, expand or even leak, according to some consumers, but manufacturers have been working on solving these issues. Despite this, some users would like it to have more resistance. We recommend this type of trainers for those who value quietness and the real feel, similar to on-the-road, one could get from this type of trainer. Unlike the other types of trainers we have mentioned, which work with your full bicycle, the direct drive setup allows you to remove the rear wheel of your bike completely. You need to mount the frame onto the trainer and attach the chain to the cassette directly in your trainer, so the trainer is completely connected to the bike. This feature makes the cycling easier because there is no chance for your tire to slip, as it might happen on other kinds of trainers. One might argue that the gearing feature can be an inconvenience as you need to take more time for you to get your cycling setup ready, but this system allows a better ride, and that’s a benefit not to be forgotten when choosing the best turbo trainer for your indoor training. 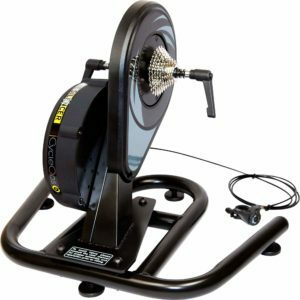 This is usually the go-to type of trainer for professional cycling teams and, also, some of the more serious indoor cycling enthusiasts. This training machine requires a lot of work before you use it but all the work pays off because this training device offers an improved and bigger stability in your training sessions and it is the quietest. Its simulation of the outdoor experience lays on the fact that it uses a big flywheel to generate momentum. You do have the pro that the wheel and tire noise are out of the system, but do not let this fool you into thinking these are completely quiet, as you still have to deal with the noise from the chain rolling on the cassette, but the overall reduction has to be mentioned. Other benefits include, as mentioned before, a smoother experience with no tire friction or the possible result of tire slip, like it can happen when using other turbo trainers since most of them rely on a roller that interacts with the rear wheel. The direct drive trainer transfers all your pedal strokes directly to the trainer, due to its full connection through the chain. We must mention, of course, that all trainers do have their downside, and in this case, this kind of trainers take a lot of time to set up, removing the wheel – which can be hard sometimes – and preparing the device, so this trainer, in particular, can be difficult to assemble if you want a quick training session. The weight may be an issue too, as these trainers are heavier than expected, rendering less portability. Some may argue, nonetheless, that direct drive apparatuses are the future of turbo trainers. Imagine you can add up to the types of bike trainers described earlier with some tech involved; you can, with Smart Trainers. So, let’s now focus on the top trainer technology. These fantastic pieces of tech allow you to train in a completely different way from its older counterparts. Who would have thought, a few years back, that digital coaching would be a thing nowadays? Smart trainers provide that, as they allow massive multiplayer bicycle competitions and other kinds of interactive and virtual reality options too. With these innovations, it is safe to assume the sky is the limit, as technology advances every day and smart trainers are just the beginning of a new cycling era. Smart trainers allow the cyclist to be involved in a different reality, one that allows them to be in a 3D environment and compete with other at-home athletes and enthusiasts. This technology can be labeled as high-end yet resistance isn’t necessarily controllable through the software, which can be a problem, because you can’t mimic the outdoor experience entirely using some models. For instance, riding uphill will offer no change in resistance in those cases, and this is a plain downside. These are labeled just as half-smart. For the whole experience, make sure you pick an entirely smart model. When it comes to software, there is plenty to choose from, with different graphics and features, which is quite useful. The cyclist can adapt their “environment” in the software according to their training needs, and for better immersion, perhaps connected the computer to a TV. The cycling competitions you may access with your smart trainer is excellent to keep you motivated, as instead of pedaling and looking at the wall, you can enter a virtual reality and compete with other real people, pedaling at their own homes. Meet Kinetic Road Machine 2.0 Fluid Trainer, our top pick in fluid resistance bike trainers. Its resistance unit functions in a completely sealed fluid compartment. The tire roller of this machine is 2.5 inches in diameter, and it is made of stainless steel. It is compatible with 22-29 inch wheels and up to 29 x 2.4-inch tires. The product is in the 69-70 decibel range, and its overall size is 32 x 22.4 x 16 inches, and it is considered a road machine. It weighs about 28.75 pounds, and it is attached to a conveniently compact and an alloy light frame. On this topic, we may also state that this bike stand trainer is rather easy to transport, as it is foldable, which makes it easy for off-season storage too! Another excellent characteristic connected to this piece is that manufacturers may offer a lifetime warranty, which is a good thing to consider while picking your bike trainer. Regarding accessories, you can pair this object with a kinetic riser ring and a kinetic training mat for better usage. Kinetic Road Machine 2.0 Fluid Trainer features a roller a bit larger than ordinary fluid trainers, which helps reduce tire wear and it promotes the temperature reduction of its spinning elements. Against what one might have seen in similar machines, the Kinetic Road Machine we are presenting to you, there is no driveshaft entering the fluid chamber, and this makes this product design stronger than its counterparts. We must also let you know this product includes a silicone fluid resistance, rare-earth magnet pairs and it provides a consistent curve. It takes 143w to ride at 15mph, 258w at 20mph and 25mph will take 430 watts, and the product itself comes with the kinetic skewer you need. Shall you pay attention to colors; this one comes only in one color: green. This product has had reviews of a stunning five stars, with people saying it is a great trainer, it is worth it, that the tire doesn’t slip and setup is quite simple and fast, so probably this is the model you have to take a look at while searching for an excellent fluid-based stand. If you are into buying an excellent magnetic bike trainer, the Cycleops Supermagneto Pro Trainer is the way to go. Its noise can vary but hits the 70 decibels mark at approximately 20 miles per hour, though it depends on speed and the kind of tire used. It has four rare, powerful earth magnets technology with also four different resistance levels. Going through the specs, we would like to state the wheel size it accepts 26’’, 27’’ and 29’’. Its dimensions are 10.43 x 13.39 x 17.91 inches, and it weighs 18.4 lbs. This product features a single-sided pro series frame, which mount permits quick bike install and removal. When it comes to accessories, this machine comes with a Race Day DVD, instruction manual as standard, but you would like to know there are front riser blocks available, along with the mat, both of which you can buy in a kit with the trainer itself. One of these provides you with an excellent way to cycle in a flat riding and the other with the climbing position. Storage comes easy as the two front legs fold back against the frame, just below the skewer. With its quick release/attach technology, it is very easy to set up. It includes a dial-in which you can control your resistance, by picking from the 4: easy (or warm up), road, hills, and intervals modes. It gives you a road like a feel with its large free-wheel. Unfortunately, you need to pause your session and unmounts to adjust these settings. It is nice to know that it also may have a lifetime warranty. A lot of people agree with him, giving it about five starts, because, among other reasons, this machine lets you adjust it even if you are working on an uneven floor. The resistance curve is also admired, along with it being a smooth, stable and solid ride. The main downside is, as expected, the lack of remote change of resistance. Can’t adjust resistance while on the bike. Our top pick for direct drive trainers is the CycleOps The Silencer. This 22 x 12 x 27 inches product weights about 12.31 pounds and accepts as maximum load, excluding the bike, of 15st 10lb. Its magnetic resistance is adjustable via a 5-level handlebar adjuster which allows an easily approachable road-like feel. It is quiet at up to 64 decibels. It is race-bike perfect due to its rear fork width of 130 mm to 135 mm to fit this machine. You won’t need your rear wheel; you need to adjust the backside of your bike and chain to the device, which will take most bikes out there, it fits 26-29 inch wheels and 700c wheels. It fits rear dropouts between 130mm and 135mm, for smaller front wheels you’ll need to use a front block to level the bike. The ride-feel provided is very realistic, which is what most athletes look for in bike trainer. It does have a big downside, though: it doesn’t fold down, and it’s pretty heavy, so storage doesn’t come easy. People give it five stars nonetheless, saying it is a top performer and highly recommendable due to its realistic ride feel. This piece of machinery is said to be smooth and perfect to get in shape, as it mimics the road experience, it makes you sweat as much as if you were pedaling outside and gives you the training you need. Regarding accessories, there are some you could benefit from. Training mats, for instance. There is one specific to this brand which minimizes vibration along with noise while protecting your floor too. You can also get sweat protection for your bike from their brand, or perhaps changing the feel to it by adding a climbing riser block to help you in replication the outdoor ride. A nice trainer bag is also available in stores so you can take it anywhere with you, or in case you want to store the trainer best. Doesn’t fold, heavy and hard to store. Suitable for the race, tri and MTB bikes, with the help of an axle skewer in some cases, this outstanding smart biking device is very quiet (85db at 200w). It has an electric motor resistance. Its dimensions are 26.6×25.6x16inch, and 22.2×16.1×9.65in when folded for proper storage; it weighs 20 pounds. This machine is supplied with a front wheel support, quick release for some types of bikes, and the ability to be adapted to uneven floors through the adjustable front legs. The position may need to be altered according to the bike you’re using, due to the size of the wheels. The realistic slope goes to about 7%, the maximum brake power at 10 seconds is 950 watt and the sprint power at 1 minute is 750 watt. Mass inertia is pointed at 11,81 kg. The part that separates this machine from the other turbo trainers is its technological features. Let’s start by talking about what comes pre-installed, which are the fitness tests, then, the tech goes further than any other trainer before. Through the use of apps like Zwift that are compatible with iOS, Android and computers alike, your workout reaches a new level. It connects through Bluetooth and ANT+FE protocol, therefore allowing third-party software to control it. It is easier to measure and control the cadence, speed, and power from the trainer and, furthermore, also control the brakes. You can attach your smartphone to your handlebar, or your tablet. The interactive part of this technology is where the magic resides, you can even create your own map or training session to work with, from hills to intervals and it is so complete it monitors your heart rate too, and it motivates you through movie clips. The reviews don’t lie; it is a great and affordable smart trainer and the app it works it is quite good, 4.5 stars are the verdict. Rear tire will wear out very quickly. You’ll need to use a trainer tire. There are some specifications you should pay attention to when it comes to choosing the best bike trainer stand for you. You must pick the resistance type you need, along with the kind of turbo trainer that matches your workout or training best. We listed the main types of machines you can go for, complete with specs, pros, and downsides, and these should help you in figuring how you can train indoors in the best way possible. After the overall view, you can find our top picks selection, in which we explained why those are stand out from other trainers on the market. We did our best to inform you, either you are a biking athlete or a cycling enthusiast who needs to move their training inside. After all, with these machines, you can cycle all year round, no matter the weather outside or the kind of training you would find outside your place. After all, even pro cyclists use them when warming up, training or cooling down after a big event or as an escape from everyday stress, so why wouldn’t a regular cyclist benefit with these incredible machines? These machines allow you a similar – if not better – specialized training for the workout methods and challenges you need to face or you decide to put you through. Now you must be prepared with the relevant know-how, and you must know most likely the kind of bicycle trainer you ought to buy, either you want to go for our top hand-picked suggestions, or you want to buy your own according to the types you read about above. Keep in mind that there are other resistance kinds, such as wind (which is probably the noisiest type) and centrifugal, and you are the one who should decide the proper bicycle stand trainer resistance and features. Elliptical static bikes are so last century! We recommend you to read, as many times as you need our bike trainer reviews top picks that show what is being highly sought for nowadays. We bet you’ll find what you’re looking for, not only by the specific list but also by the kind of trainers descriptions we put together to help you best, for you to make an informed decision. Regarding prices, these may vary according to what you sought for, as some older models or technologies may be cheaper. But, as you must have seen, the newer, more complex types of bike stands may worth every penny you put into them. As the features get better and smart bikes really are a peek into the future, letting you know there is always room for tech improvement, either in mechanical or immersion technology with the software advancement. In older models, you may need to buy accessories that help you monitor your heartbeat, for instance, but the more straightforward you go, the more advanced features you get. 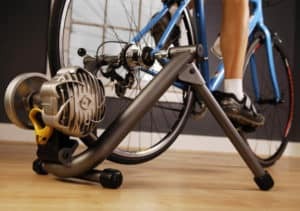 We hope this article helped you in some manner; perhaps when it comes to understanding the differences or deciding what’s the best indoor bike trainer that suits you and the use you need to take from them.